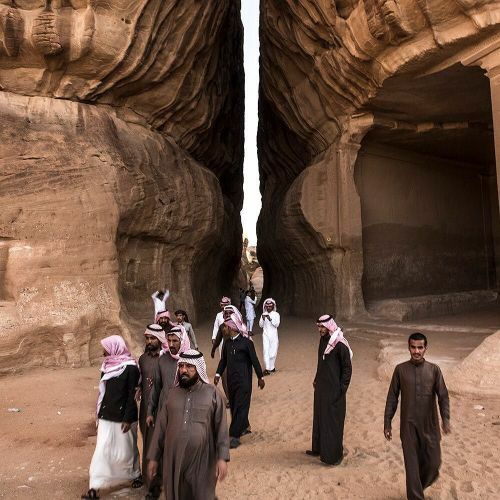 "Saudi tourists at Mada'in Saleh — al-Hijr in Arabic — an ancient settlement of the Nabatean Empire. The site, which @bdentonphoto photographed for @nytimestravel, was Saudi Arabia's first @unesco World Heritage site. About 2,000 years ago, the Nabateans had lived nearby and carved massive, elegant tombs into the rocks, adorning their entryways with statues of birds and images of flowers, faces and serpents. Today, the tombs are empty, mostly cleaned out by grave robbers long ago, and the plaques around the site lack detail on the wider culture. Visit the link in our profile to read more about the reporter @nytben's trip to Saudi Arabia — his "first lesson in what it means to travel in a country full of potential tourist sites that the government is ambivalent about letting foreigners see."" By nytimes on Instagram.